This adorable and simplistic flower earring set features a cubic zirconia stone in the center. It is made of sterling silver which gives it a beautiful shine. Lightweight and perfect for dailywear. Very elegant and chic. Pair it with the similar pendants we have. It can be a great gift or some indulgence for yourself! 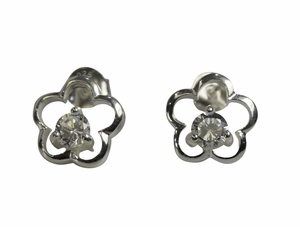 This adorable and simplistic flower earring set features a cubic zirconia stone in the center. It is made of sterling silver which gives it a beautiful shine. Lightweight and perfect for dailywear. Very elegant and chic. Pair it with the similar pendant we have. It can be a great gift or some indulgence for yourself!